Expression of Gsk3b-his in mouse brain. (A) Schematic of the Gsk3b-his transgene inserted downstream of MoPrp (MoPrp.xho). ex1, exon 1; utr, untranslated region. (B) GSK-3β-his protein expression in cortex, striatum, and hypothalamus of WT, PrpGsk3bL56, and PrpGsk3bL64 transgenic mice was assessed by immunoblotting for 6X-his tag. Partial N-terminal proteolysis yielded a second, smaller band that reacted with C-terminal GSK-3 antibodies and was also observed for endogenous GSK-3β (see D), as reported previously (40, 41). GAPDH was used as the loading control. (C) Total GSK-3β protein expression in cortex and striatum of WT, PrpGsk3bL56, and PrpGsk3bL64 mice detected with an N-terminal, GSK-3β–specific antibody. 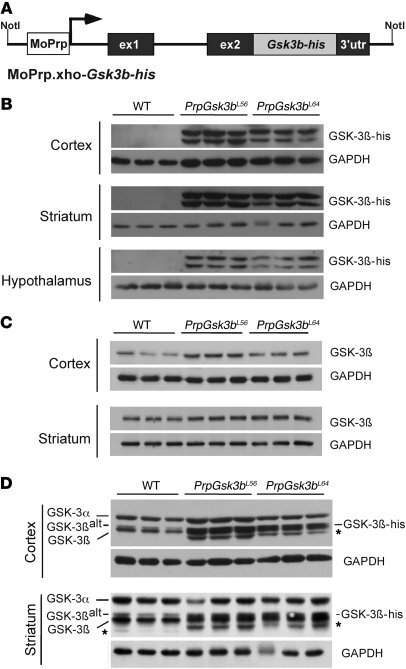 (D) GSK-3α and GSK-3β protein expression in cortex and striatum, detected with an antibody that recognizes the C-termini of both GSK-3α and GSK-3β antibody, confirms partial proteolysis of endogenous GSK-3β and GSK-3β-his (asterisks). An alternatively spliced form of endogenous GSK-3β is indicated (GSK-3βalt). GSK-3β-his migrates between the endogenous GSK-3β and GSK-3βalt forms.